Velouté is one of the five mother sauces of classical cuisine. It can be made with any white stock, but this version, the fish velouté, is made with fish stock. There's also a veal velouté and a chicken velouté. 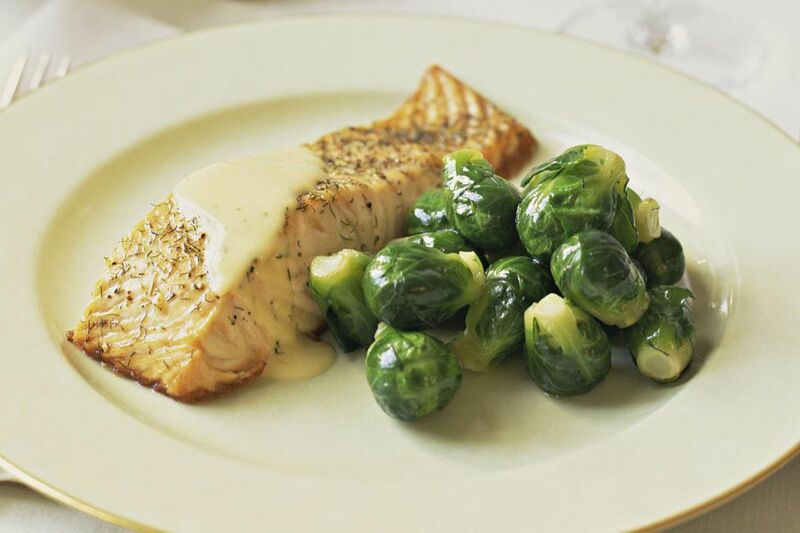 Fish velouté is the basis for the traditional White Wine Sauce, as well as the classic Bercy sauce, the Normandy sauce, and many others. Note that the velouté is not itself a finished sauce — that is to say, it isn't typically served as is. You could, however, simply season it with salt and pepper and use it much as you would a basic gravy. Heat the fish stock to a simmer in a medium saucepan, then lower the heat so that the stock just stays hot. Meanwhile, in a separate heavy-bottomed saucepan, melt the clarified butter over a medium heat until it becomes frothy. Don't let it turn brown, though — that'll affect the flavor. With a wooden spoon, stir the flour into the melted butter a little bit at a time, until it is fully incorporated into the butter, giving you a pale-yellow-colored paste. This paste is called a roux. Heat the roux for another minute or so to cook off the taste of raw flour. Using a wire whisk, slowly add the hot fish stock to the roux, whisking vigorously to make sure it's free of lumps. Simmer for about 30 minutes or until the total volume has reduced by about one-third, stirring frequently to make sure the sauce doesn't scorch at the bottom of the pan. Use a ladle to skim off any impurities that rise to the surface. The resulting sauce should be smooth and velvety. If it's too thick, whisk in a bit more hot stock until it's just thick enough to coat the back of a spoon. Remove the sauce from the heat. For an extra smooth consistency, carefully pour the sauce through a wire mesh strainer lined with a piece of cheesecloth. Keep the velouté covered until you're ready to use it.